Everyone knows what The Met is. The largest art museum in the United States, it is also ranked fourth on the list of the most visited museums in the entire world, regardless of topic. 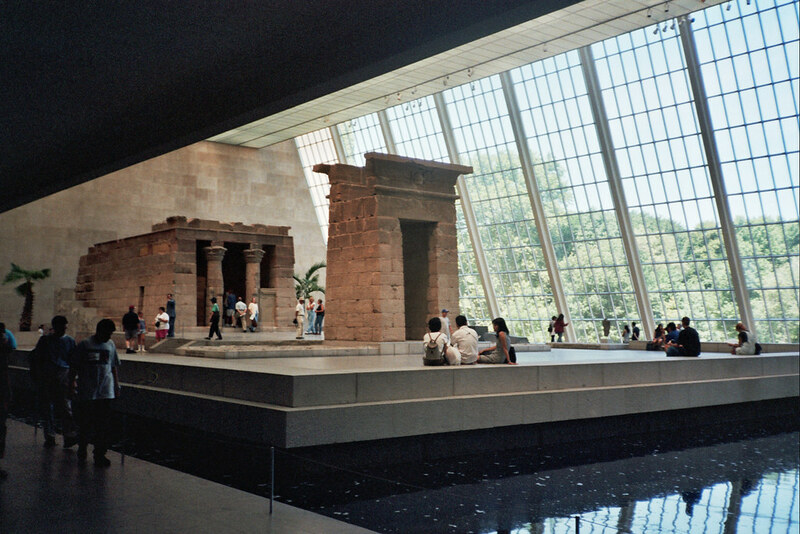 Without question, the Metropolitan Museum of Art is the top educational, artistic, and historical destination in New York City for everyone, not only students. It's an invaluable source of information and artistic education, leading visitors all the way back into antiquity before stretching your imagination, teaching you something new, and inspiring you into the future with endless possibilities. The Met was founded in 1870 and opened two years later after several years campaigning for funding among the New York elite. Socialites, businessmen, lawyers and artists came out and championed this potential hall of learning, propelling it into reality. The original advocates had seen what art galleries and museums were like on a trip to Paris, and wanting that for their own people in America, set about making it happen. The first building to house the Met was located at 681 Fifth Avenue, only a few blocks down from its current position. Their first acquisition was a Roman sarcophagus along with 174 European paintings including works by Nicolas Poussin. As they grew, the building moved down to West 14th Street until finally moving to its location at Fifth Avenue and 82nd Street. The original building, which can still be seen in the Robert Lehman Wing, was designed by Calvert Vaux and Jacob Wrey Mould in a Ruskinian Gothic style. The Beaux-Arts facade that everyone knows and loves was finally cast into being by Museum Trustee and architect Richard Morris Hunt. The Met reopened in 1902 to wild acclaim and was said to be the "only public building...which approaches the dignity and grandeur of the museums of the old world." So let's see what they've got in store for us today, shall we? The Met holds over two million works in its permanent collection alone, over 17 curatorial departments, ranging from antiquity to modern art. If you endeavored to see every inch of the museum it would take you several days. And that's not even all of it! The Cloisters, a museum in Fort Tryon Park created from the structures of five European religious abbeys, houses much of the Met's medieval art collection off-site. The museum's newest expansion, The Met Breuer, opens this month on Madison Avenue and 75th Street and will house the modern and contemporary art program. You enter into the Great Hall and are immediately struck by the magnificence of the building. If you go left, you'll enter the Greek and Roman Art exhibit, right leads into Egyptian, and straight jumps a little further ahead into Medieval Art. Other historic exhibits on the first floor include Arms and Armors, the arts of Africa, Oceania, and the Americas, as well as exhibits on American Art and Modern and Contemporary Art. European art, in its fullness at the Met, takes up much of the second floor, alongside Asian art, Arabic art, and even more examples of American and Modern and Contemporary art. This seems like a lot to take in, I know, but it's easy enough to handle once you dive right in. It's the art and artifacts that are magic to the eyes, that sing to the soul, and feel special only to you when you encounter something unique. And everything at the Met is unique. Encounter things like a ceramic painted oil flask from 440 B.C., a full dining room from the historic Lansdowne House of the 18th century, and even Van Gogh's famed Cypresses. Leonardo da Vinci is represented in paintings and sketches, along with Rembrandt, Van Dyck, Durer, and Degas among others. But you'll find more than European art here. Arguably one of the most important acquisitions of the Cesnola Collection is the Amathus Sarcophagus from 5th century B.C. and the ruin of the Temple of Dendur, an Egyptian temple built by a Roman governor around 15 B.C. But all this touring is bound to make you hungry. Good thing the Met has several options for food including the Cafeteria, Petrie Court Cafe, American Art Cafe, Roof Garden Bar, and even more. And certainly don't forget to stop by the Museum Store. They sell all kinds of amazing products from authentic replications of art to books, jewelry and apparel, and religious pieces for a number of faiths. If you're still iffy on whether or not you really want to visit the Met, think about the wonderful adventure you can take through time and space. Just by stepping inside this grand museum you can travel back to ancient Egypt and visit a temple dedicated to the goddess Isis, surround yourself with art from lush Persia or exotic southern Asia. There's nothing quite like it and there's no better time machine than museums.